The Community Development Council, State state Chapter, O'CDC, has implored striking Civil servants in the state to be a little more patient with the State Government. The Council Assistant Secretary, Amosun Ismaila, said this while addressing journalists in Osogbo, the State capital on Thursday. The Council implored the workers to sheathe their swords on the ongoing industrial strike action and be ready to shift ground with the Government. Ismaila who spoke on behalf of the State Chairman, Alhaji Yisa Abubakar, also urged the representatives of the Labour Unions and representatives of the State Government to come together in one accord to lift the state up. "The Community Development Council of Osun state which is a community organization poised at harnessing resources to revamp and develop the state therefore appeal to the workers unions to be more patient, as they are the engine room of the government that will ensure the continuation of the developmental programmes and projects of the government in the state. "As a matter of fact, strike is a legitimate means for workers to press home their demands. It is a real fact that the state government and other stakeholders have been trying in resolving the issue. "Workers should be persuaded by the fact that the political office holders in the state are also being paid 50 percent of their total pay due to economic crisis. "We equally realized the yearnings of our teeming workers in the state on the issue of promotion of its members which of course regarded as statutory obligations of the government to fulfilled but we are of the opinion that government know this and must adequately attend to it as a matter of urgency but we should all resolve to sit on a round table for a thorough discussion. "We believe Mr. Governor understood the plights of the workers and has given his words as regards this, that there will be a great improvement the moment we have a good turn around about our economy both at the State and Local level. "We must remind our dear workers that the Government as we all know has genuine commitment to settle all outstanding salary liabilities as soon as the economy improves in the New Year." Ismaila explained. 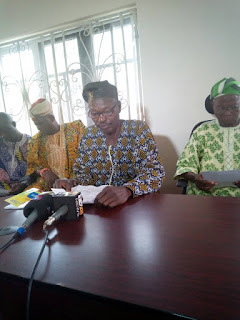 The Council however, urged the state Government led by Ogbeni Rauf Aregbesola to address the demands of the workers as soon as possible in the best interest of the State and its citizens.